An interview with Janet Hancock from the Public Record Office of Northern Ireland (www.proni.gov.uk) about the new premises at Titanic Quarter due to open imminently, and future plans for the PRONI website. The latest issue of Discover my Past Scotland (issue 29, March 2011) is now on sale. Rabbie's Kin – are you related to Robert Burns? Priced at £2.50 per issue you can view it online at www.discovermypast.co.uk or download in PDF format to read on your computer or iPad. Long term readers of the blog will remember the frustrations I used to vent about the Irish Family History Foundation website, now known as RootsIreland (www.rootsireland.ie) which used to be next to impossible for research purposes, for the simple reason that it cost far too much and had very limited search fields. It was a cry shared by many - but in this case, the story has had an unbelievably happy ending. The IFHF listened to its users and recently radically overhauled the site, with price discounts, extensive search fields added via a new Advanced Search facility, and much more. I caught up with the group's Karel Kiely at Who Do You Think You Are Live and not only learned that the changes are still ongoing, but also discussed the state of Irish genealogy as a whole in a time of economic devastation on the island of Ireland. Is the genealogy and family history industry actually one area that can radically grow in troubled times? RootsIreland is a great site now, doing great things - a huge thanks to Karel for the interview, and to the team for taking the steps to really push the site to where it needed to be and to where it happily now sits, as one of Ireland's premier genealogy sites. At the Who Do You Think You Are? 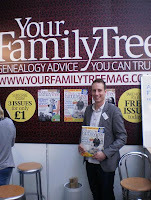 Live event I caught up with Tom Dennis, the new editor of Your Family Tree magazine, who I not only got to reveal a tale of bigamy in his ancestry, but who I also managed to get to thank his designer publicly (you owe me one Alex!). I caught up with Jeanette Rosenberg of the Jewish genealogical Society of Great Britain, to talk about her new Gorbals Jewish school children database (the result of a project at the University of Strathclyde) which names some 10,000 children from the turn of the 19th / 20th centuries. Penny Law, Family History Monthly's chief, fresh from a ski-ing holiday somewhere cold and continental! ABM Magazine's Mary Evans on the bookstall! 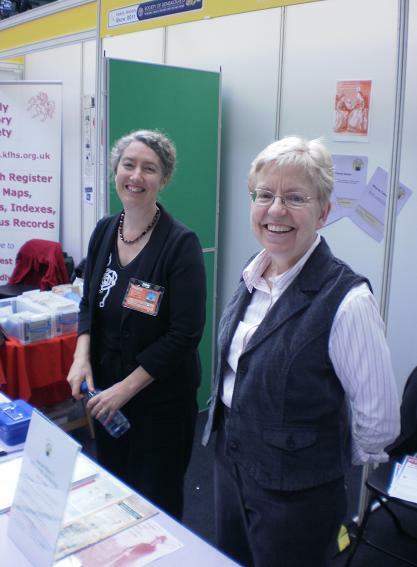 Liz Blatchford on the Family and Local History Handbook stall where I worked for the 3 days. No-one knows what she has done with Bob...! Deceased Online hard at work! * The merged body established by the merger of the General Register Office for Scotland and the National Archives of Scotland is to be known formally as the National Records of Scotland. * FindmyPast (www.findmypast.co.uk) will be launching the 1841-1901 Scottish censuses on its site this year - but in transcript form only. There is also a whole rake of Irish material to be going online, and more military material. * The images from Scottish Monumental Inscriptions (www.scottish-monumental-inscriptions.com)impressive collection of graveyard CDs are now hosted online at Deceased Online (www.deceasedonline.com), and new additions will be added regularly - you can buy an entire CD of images or a dataset per surname (per CD). The new addition to the site is very much still being developed, but it is online now. * Records from the British Library's India Office collection are to be digitised. * News from the Association of Genealogists and Record Agents (AGRA) coming soon, so keep an eye on its site at www.agra.org.uk. * A new FamilySearch course is to be launched by Pharos Teaching and Tutoring Ltd (www.pharostutors.com). * A new masters based genealogical course from the University of Dundee has been launched. * More pre-1858 Name Search records to be added to the PRONI website (www.proni.gov.uk) soon. * Who Do You Think You Are? Live is now run by the BBC - next year's show is likely to see some themed elements, such as Sport (because of the Olympics) and Transport (because of err... Top Gear?!). Family history stalls will apparently be getting more room to exhibit. I've interviewed several people and will let them speak for themselves over the next few days about these and other developments...! Day 3 of Who Do You Think You Are? Live ended on a high, albeit as a much quieter event, and possibly quieter than last year's Sunday also. Still a lot happening, and I managed to video interviews with Nigel Bailey of TheGenealogist.co.uk, Karel Kiely of RootsIreland (aka the Irish Family History Foundation), Janet Hancock from PRONI, Audrey Collins from TNA, and Debra Chatfield from FindmyPast. I also managed to meet John Reid from the Anglo-Celtic Connections blog for the first time, to catch up briefly with Ian Marson of AGRA, and also spent an hour on the stall for the Association of Professsional Genealogists where in addition to meeting many other members of the society I also had the pleasure of chatting to someone from the BBC Archive who happened to pop along to enquire about membership! I have previously blogged about the archive's policy on dealing with non-institutional based enquiries, and was advised to ignore it and to send my enquiry in anyway! As usual Nick Barratt was running around like the proverbial blue-bottomed fly, but I caught up with him to discuss genealogy cruises and time travel, and had chats with many of the UK based genealogy magazine editors I write for, as well as meeting Your Family History's editor Laura Berry for the first time to discuss some possible articles in the near future. My new book was being on the same stand as the magazine (same publisher), and was happily flying off the stand, which is a bit odd for an inanimate object really! Whenever the show ends there is always a real sense of deflation after such an intense burst of adrenalin, but it was definitely a fun event and Hell won't stop me returning next year. I said goodbye to the Blatchfords, who I'll be seeing again in Newcastle in a few months time, and made my way to Euston station for the long trip back on the Caledonian Sleeper. But what did I discover at WDYTYA Live?! Oooh, shed loads - but that's for another post...! As the mist cleared, day 2 got underway at Who Do You Think You Are? Live. Yesterday was a fairly constant flow of traffic, today was a bit more up and down in feel - when people came to the Blatchfords' stall it felt at times as if they were arriving in attack formation! But we persevered and eventually won through - another VERY busy day! I managed to get out and about again to talk to the great and the good, and even managed to have a microphone pointed at me at one point by Adam Rees of Your Family Tree magazine for a podcast they are hoping to put online soon. No idea if I made any sense but if it makes it online, you may need to slow it down as I talk like the plague is in town. Yesterday I got talking to Tony Robinson about archaeology (I used to make archaeology programmes for the BBC, and used to sell cheese to him as a student in Bristol at the local ASDA store!). Today, I bumped into Miriam Margolyes, from Harry Potter films, who was lost and looking for directions to the Your Family History stall. Hope she made it there. I also grabbed some more video interviews, with Jeannette Rosenberg of the Jewish Genealogy Society of Great Britain, Sherry Irvine from Pharos Tutors, and Bob Blatchford from the Family and Local History Handbook, all going online next week. Another high point of the day was having suggested to a student a possible way to get a work experience to then hear later that it actually worked out - glad to help! In the evening I attended the vendors do upstairs in the hall at Olympia, and the head of BBC Magazines was there to talk about plans for the future of the show, now that they have take over from Brand Events. After this, managed to grab a pizza with several genies, inclusing Emma Jolly, Rosemary Morgan, Sheena Tait, Celia Heritage and Mike Kostiuk, before ctahcing up with Ali MacDonald, Tahita McCabe and others from the University of Strathclyde's genie programmes in Glasgow. A packed day - one more to go...! A truly manic day yesterday for the first WDYTYA Live, very busy indeed, but very good fun! We launched the new Family and Local History Handbook which was almost literally flying form the stall (811). When I came up for air I managed to grab a few video interviews with Alasdair MacDonald, Scotland's rep for Family Tree DNA, Tom Dennis, the new guv'nor at Your Family Tree, and Patricia and Caroline from the University of Dundee's genealogy programme, which I will place online in a couple of days time when back home in Alba. I also managed to catch up with The Pharos Teaching and Tutoting Ltd team, Helen Grant from Scottish Monumental Inscriptions, who now has her data launched on the Deceased Online platform, as well as the DOL team itself, with lots of exciting new developments to come, and Debra and Amy from FindmyPast - this year's dress code on their stall being English vicars! The evening ended with a great reception organised by FindmyPast, where I discovered that one of Britain's most well known genies shares the same obsession with travels in time and space as I do - and I'm not talking family history here! Well I've been at Kensington's Olympia venue with Bob and Liz Blatchford all day getting ready for tomorrow's Who Do You Think You Are? Live. We're all set and ready to go - come visit us at stand 811, where there are some seriously good offers on the Family and Local History Handbook! Also, top tip - if you are looking to buy Family Historian 4 (the programme I use as my main tree programme for my personal research), My History is the next stall to us and they have a nice discount going for the show. I've had a chance for a quick recce and already all sorts of things to report. Check out FindmyPast and Genes Reunited - we're not quite at Hollywood sets yet, but two impressive display areas - a real feeling of a show being put on this year by many vendors, seems a lot more visual this year. Debbie and Amy from FMP won't tell me what their costumes are for tomorrow though, but suffice to say I suspect they will be stepping up to the altar...! 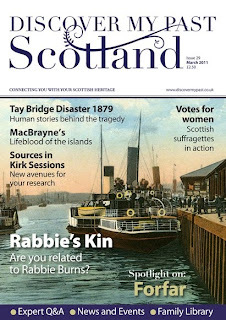 I had a quick chat with Nigel Bailey from The Genealogist - I won't pre-empt his news until tomorrow, but a couple of interesting developments happening soon, one or two in beta development, which will be of use to those with Scottish research. From the Jewish Genealogical Society of Great Britain, Jeanette Rosenberg has told me that she has now placed her database of Jewish children at School in the Gorbals in the early 20th century online, with just under 10,000 names available. More on that soon. There's a really good vibe in the air, the weather looks like it will be fine, and I finally managed to lay my hands on a copy of my new book, so a wave of optimism has been unleashed (at least here!). And I even managed to blag a copy of the next Your Family Tree magazine. Oh yes...! 130 more volumes have been added to The Medical History of British India website (http://digital.nls.uk/indiapapers/index.html). You can now search under key subjects like diseases, institutions and drugs as well as full-text. Content on veterinary medicine and lunatic asylums will be added to the website in the next few months. Surname Atlas, which was first launched in April 2003 at the Guild of One-Name Studies AGM & Conference in Liverpool, has been updated to version 1.1 and will be available at the Who Do You Think You Are? Live show at Olympia London on 25th to 27th February 2011. Visit the Guild of One-Name Studies tables 36 and 37 and purchase a copy at the new price of £15.00. Surname Atlas will also be available to purchase on-line at the Guild of One-Name Studies website www.one-name.org/sales.html. Surname Atlas plots surname and first name data from the 1881 Census. This is the simplest tool to use to demonstrate a surname distribution in Great Britain, and is regularly demonstrated at Fairs attended by the Guild of One-Name Studies. Even non-genealogists can get hooked! The Atlas can display at county level or at poor-law Union level, using absolute numbers or relative frequency. The British 19th Century Surname Atlas is a fully interactive CD-Rom product that allows you to plot distribution maps for all of the surnames and forenames found in the 1881 census of England, Scotland and Wales. Using the program is simplicity itself: just insert the CD in your drive and wait for it to load. Then enter a surname in the data entry box and hit enter. •Plot any of the 400,000+ surnames & variants that appear in the 1881 census. In many cases the maps will indicate the probable geographical origin of a surname. •Plots any of the 160,000+ forenames, and view their popularity through time. •Aggregate data by county or poor law union. •Plot data as actual numbers, or a density (per 100,000 of the population). •Include any collection of name variants on each map. •Show one or four surname maps at any one time. •Zoom and pan the maps to frame exactly the area you want to see. •Print maps, or export to the Windows clipboard. •County Surnames tab added – identifies which surnames have a higher total percentage in a particular county than any other county. For example the surname “Beerling” is the most popular surname (by percentage) in Kent – with 93% of all “Beerlings” alive in 1881 being born in Kent. •An increased program window dimensions increased to 1000x700 with a screen resolution of up to1024x768. •Extended maximum zoom percent to 5,000% (mainly for London). Ancestry has placed the UK's Dictionary of National Biography online at www.ancestry.co.uk. Volume 21 is missing, so the release contains Vols 1-20 and Vol 22. I'm off to London Tuesday morning at 7.15am for six days, to do a couiple of days research at the National Archives at Kew, and then to spend four days at London Olympia, preparing for and then working at Who Do You Think You Are? Live. I'll be working on the Family and Local History Handbook stall with Bob and Liz Blatchford for three days, pushing out the new edition (number 13), and also doing an hour on the Association of Professional Genealogists stand on Sunday from 1-2. Whilst there my new book will go on sale, Tracing Your Family History on the Internet, which you can find on the Pen and Sword stand, and I'm more than happy to answer any questions on your Scots research or otherwise! I'll do my best to blog from the venue and to tweet if I can, and hope to grab a few video interviews with folk also whilst there. Say hi if you read this blog - and I'll see you soon! A new addition to our series of County Guides is now available. It shows how to best use the records available for conducting research on Galway families, and where they can be accessed. For each type of record it provides background information on how they were compiled and what information was contained, and on which categories of people. It also provides background on the social history of County Galway and how this history has affected the keeping and survival of records. Audrey Collins has posted a blog post on future developments on the Irish records digitisation front, based on a talk she attended at Rootstech, and given by Brian Donovan of Eneclann. A key development which I think will benefit everyone is the launch later this year of various all Ireland court records collections. I hope everyone had a good Christmas and New Year; we certainly did despite the horrible weather. Since early New year here at Scottish Monumental Inscriptions most of us have been down with the Flu, Chest Infections, sore throats etc, so it's just now were all starting to get back to normal, hopefully that's everyone had their share for this year. We have still managed to get some new CDs for you and they are as follows. Tenandry Kirk Killicrankie due to be added to Rothimurchus. We have lots more due soon. Going to WDYTYA this year? I will be helping out on the Deceased Online stand, come by and say hello. Business Archives Scotland has substantially increased the frequency of updates on its blog at http://businessarchivesscotland.blogspot.com, with some 29 posts already over the last six weeks, more than all of last year in its entirety. Included in the new series of posts are case studies describing certain company based archives and initiatives which may be of use to your research, including the work of the RCAHMS, the Lloyds Banking Group, The Ballast Trust, Diageo, Aberdeen Maritime Museum and more. If you've not yet visited the blog, pop along and have a browse, and if I were you, bookmark the site also - there's a lot happening! The Genealogical Society of Victoria (www.gsv.org.au) is hosting the Third Australasian Genealogy Conference on a Scottish Theme. Catch the Moments - Scotland 1750-1850: A Century of Transformation is to be held on April 16th-17th 2011 at the Hemisphere Conference Centre, 488 South Road, Moorabbin, Melbourne, Victoria. There are several speakers, including top genie Sheena Tait, who many readers will know from several UK family history magazines, for which she is a regular contributor. There is more on the programme - and it is packed!!! - at www.gsv.org.au/images/stories/Forms/Scottish%20Conference%202011%20-%20Abstracts%20and%20Speakers.pdf. Should be a good one! Also - coincidentally, tomorrow I'm teaching the last week of the current Scotland 1750-1850 Beyond the OPRs course for Pharos, but the course will run again from October 17th - for more information see www.pharostutors.com. John Reid's Anglo-Celtic Connections blog has news of a talk entitled Scottish Home Children, by Lorraine & Gordon Reoch, to take pace this coming Sunday February 20th, 2.30pm, at The Olde Forge Community Centre, 2730 Carling, Richmond, Ottawa. The talk will focus on William Quarrier's homes, and four of the orphaned children resident in them who were sent to Canada. For more information see http://anglo-celtic-connections.blogspot.com/2011/02/quarrier-children-from-glasgow.html. In 2009, we announced our intention to charge for our visitors' car park as part of a wider savings exercise. However, we delayed the implementation date as we were dissatisfied with the technical solution offered to manage our car park bookings, as it did not meet our rigorous customer service standards. The technical problems have now been resolved but the intervening 18-month period since the original announcement has provided an opportunity to reassess our financial position, and we have therefore decided to extend the free parking period. We will keep the situation under review. However, assuming there are no new external pressures, we anticipate the free parking period will continue for 12 months. The St. Patrick's Day Festival in Coatbridge has a packed list of events starting March 1st with a showing of a film about James Connolly, followed by a whole rake of events over the next two weeks. Family history gets a look in, and I'm delighted to say I'll be doing a talk entitled How to use the Internet to research your Irish Ancestors at Coatbridge Library, Buchanan Centre, Main St, Coatbridge on Saturday March 12th at 1pm. The talk will cover the absolute basics, but with a few surprises also for those already well stuck into their trees, and will be about an hour long. I'll also be more than happy to answer any questions on any problems you might have with your research (if I can! ), assuming we don't get kicked out of the library at 2! For details of the full programme visit the festival website at www.stpatricksdayfestivalcoatbridge.org. There are a couple of Scottish developments from records provider Deceased Online (www.deceasedonline.com) this month. The company has today announced the major release of records for St Pancras and Islington cemetery in London (England's busiest burial ground), following on from the recent release of 105,000 burial records for St Peter’s Cemetery and Churchyard in Aberdeen. However, two other big developments for Scotland have been announced by the company. First, it has just struck up an agreement with Scottish Monumental Inscriptions (www.scottish-monumental-inscriptions.com) to allow the company to sell its gravestone CDs via the Deceased Online website. SMI's Helen Grant will in fact be on the Deceased Online stand at Who Do You Think You Are? Live next week, and as I'm working on the next stand, I'm fully hoping to catch up for a tea break at some point with her! The graveyard CDs should be on the Deceased Online site by end of next week. On the records release front, Deceased has also announced that the next big Scottish release will be for Edinburgh city’s crematorium and Seafield Cemetery, with some 320,000 records expected in the first tranche. These should go online some time in the spring. Also, in its press release for today's English release, the company sates "There are many other areas where clients have either agreed to go online or the business process is in the final stages and these include major authorities in the northwest, northeast and southwest of England; at least three more London authorities; and important and historical areas of Scotland" - so more to come! Irish opposition party Fine Gael announced yesterday that as part of its tourism strategy it "will examine the feasibility of releasing the 1926 census to stimulate genealogy tourism” when it wins (sorry, if it wins!) the next Irish election. The census is not currently due to be released until 2026. There was no Irish census in 1921, north or south, due to the War of Independence. If the census is released early, it will be for the southern counties which at that time constituted the Irish Free State. Michael Dun has kindly been in touch to provide me with an update to his simply brilliant War of 1812: Privateers web project at www.1812privateers.org. Letters of marque were basically licences issued to merchant vessels allowing them the right to attack and capture enemy vessels. Michael's database has been sourced from two Admiralty collections at the National Archives at Kew, ADM 7/328 [1793-1801] and ADM 7/649 [1803-1815]. The records have been ordered by master’s name and vessel name, ands there is also a vessel index. Again, sourced from TNA (ADM 103/466) and including the names of some 15,000 army, navy and merchant navy prisoners held in the United States. Those loveable loves at Am Baile have placed an interactive virtual tour of Inverness Town House online. Quick Time is required to view the presentation. You can go for a spin inside the hall, or click on objects within the room to find out more about them. To see the tour in English, click here; agus sa Ghàidhlig anseo. The Guild of One-Name Studies is to offer a special extended membership to new joiners at the forthcoming Who Do You Think You Are? Live show being held in the UK at the Olympia, London on Friday 25th to Sunday 27th February 2011. Normally membership of the Guild costs £15.00 and covers a period of up to a year with renewal on 1st November 2011. This special extended membership will cost £20.00 but will include a full year's extra membership, renewal not being due until 1st November 2012. The aim of the scheme is to attract more new members and to encourage these members to stay with the Guild for longer and to appreciate and utilise the various benefits available to members. This extended membership option has been introduced following the completion of an internal membership retention survey which identified why existing members joined the Guild, their knowledge and use of Guild services and facilities and the reasons why members failed to renew their membership. If this offer of an extended membership proves successful it could be introduced on a wider basis. A new online social networking site dedicated to all matters Scottish launched recently in Beta format. 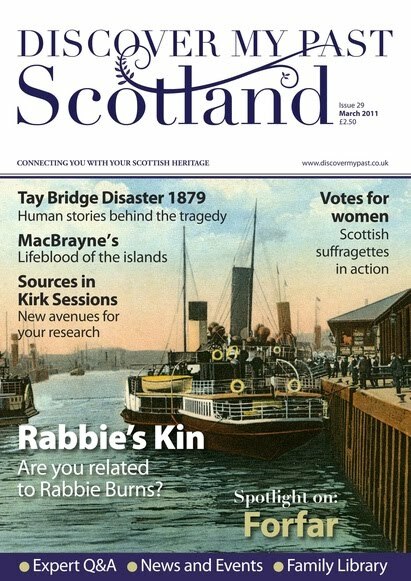 I've created a new group on the site, Scottish GENES, to provide another way for you to sign up for all the latest genealogy news and events! To sign up you'll need to register with KILTR for free at www.kiltr.com - the group itself is available at www.kiltr.com/Group/2872870. The site promises a lot in the next few months, so here's to it and good luck! NB: Personally at the moment I find that KILTR works much better through Firefox than Internet Explorer. Remember you can also follow Scottish GENES on Twitter and Facebook, or by daily email feed by subscribing through links on the right hand side of this page. Just heard of this, so sorry for late notice! A series of programmes from the BBC on the history of medicine - 2 days left to listen to it online, and it is 330 minutes long, with several programmes. "BBC Scotland's health correspondent, Eleanor Bradford looks back at the history of medicine in Scotland. Featuring Billy Kay's four part series Cheating Death, the story of the Lennox Castle Hospital and The Lock in Glasgow. We'll also be hearing about the benefits of fresh air, and celebrating the 250th anniversary of the Edinburgh Royal Infirmary in an archived programme from 1979." It is to be staffed by volunteers who are experienced in family history research and are there to advise visitors. For those who have never visited the society’s research centre before, there is a rich collection of records related to family history, covering both the counties of Northumberland and Durham. Members have generously donated family trees and family histories and they are located in the library. To enhance the contemporaneous knowledge of ancestors, there is a very good section with local history publications covering both counties. The centre has an up to date IT system that not only gives access to the society’s own databases and CD’s. It also has access to the library/community editions of both Ancestry and FindmyPast. Facilities are available to make tea or coffee and also to eat any refreshments brought in by visitors to the centre. London, United Kingdom and Tel Aviv, Israel – February 14th 2011: To celebrate Valentine’s Day and the opportunity it presents for the British to drop traditional reserve and openly express affection, the world’s largest family network, MyHeritage.com, launched today a search for the most romantic British love letter ever written – with the UK’s best-selling chick-lit author, Wendy Holden, acting as judge. From Valentine’s Day, MyHeritage.com is calling upon the British public to delve into their attics and shoe boxes to find ancestral love letters, and submit them via www.myheritage.com/loveletters. Participants are also welcome to submit more recently-written love letters and messages for consideration. The best submissions will be featured on the special competition webpage within MyHeritage.com, with the most romantic British love letter of all time – as chosen by Wendy Holden (author of The School For Husbands, Beautiful People and Gallery Girl) – being announced on Friday Feb. 25th 2011. Full competition terms and conditions online. To provide inspiration, MyHeritage.com has teamed-up with a number of leading UK museums and archives – including the British Library, The Royal Naval Museum, and The Imperial War Museum – to obtain scans (and transcripts) of significant British love letters from the past 500 years. These include the first love letter written in English (from 1477), and poignant missives penned by an unknown World War Two airman based in Yorkshire. The historical British love letters can be found in an online gallery at www.myheritage.com/loveletters. The initiative is part of a drive by MyHeritage.com to encourage people to collect and preserve their family memories online – past and present. Romances between older living relatives and ancestors, often illustrated in love letters, are a critical point in every family’s history. With over 54 million users around the world, MyHeritage.com has become the leading place online for creating and sharing a family tree. Letter written by an airman, ‘Jonny’, to his sweetheart during the Second World War. From the address, it can be established that Jonny was situated at the RAF base in Melbourne, Yorkshire, which was open from 1940 – 45. It is believed that the letters were written at some point during this time frame. No other information is known about the writer of this letter, or the recipient. I love you very, very, very much. Lyrics for “The Bonnie Banks o’ Loch Lomond”, or simply “Loch Lomond” for short, the well-known traditional Scottish song. Interpretations of the song vary. One is that it is attributed to a Jacobite Highlander, captured after the1745 rising (often referred to as the ‘Forty-Five), when Charles Edward Stuart – commonly known as Bonnie Prince Charlie or the Young Pretender – attempted to regain the British throne for the exiled House of Stuart. Some schools of thought believe that this version is written to a lover who lived near the loch; and is sung by one of two captured soldiers, the one who was sentenced to die – the low road being symbolic of the passage to the underworld. A second interpretation is that the song is sung by the lover of a captured rebel, who was awaiting execution in London. It was common for the heads of executed rebels to be set upon pikes and exhibited between London and Glasgow. A morbid procession along the “high road” (the most important road) would follow, although the relatives of the rebels were forced to walk back along the “low road” (the inferior road travelled by peasants and commoners). Sir Walter Raleigh’s last correspondence to his wife, written during his imprisonment in The Tower of London, on – what he thought was to be – the eve of his execution (1603). Raleigh had been tried and convicted of treason, after his alleged involvement in the Main Plot (a conspiracy by English Catholics to remove King James I from the throne). A letter from Henry VIII to his second wife Anne Boleyn during 1533 – the same year that they were married. Owing to Henry’s annulled marriage to Catherine of Aragon, the union of Henry and Anne – and her subsequent execution – made her a key figure in the political and religious upheaval that was the start of the English Reformation. The Paston letters are a remarkable collection containing over 400 letters (c.200,000 words) written over three generations by a Norfolk family. From these, the example featured on MyHeritage.com is the oldest love letter in Britain, dating back to 1447. It is also the first-recorded reference to a person being described as a Valentine. The letter was written by Margery Brews to her fiancé John Paston, and it alludes – in some agitation – to dowry arrangements for their impending marriage. It is written in an informal style, with several personal flourishes in the way she forms her letters and no special concern for consistency in spelling. The lettering is not always easy to decipher, and transcripts of the manuscript vary somewhat as a result. My next book, Tracing Your Family History on the Internet, has been published early by Pen and Sword to take advantage of Who Do You Think You Are? Live next week. (It was originally due to be published March 24th). The book will be available there from Feb 25th, though not sure yet when pre-orders may be going out. The internet is revolutionizing family history research. Every day new records and resources are placed online and new methods of sharing research and communicating across cyberspace become available. Never before has it been so easy to research family history and to gain a better understanding of who we are and where we came from. I just want to take this opportunity to thank top genie Simon Fowler, former editor of Ancestors magazine, for suggesting that I have a go at the book initially, and for his many comments subsequently on the text (he didn't make me move mountains as such, but did suggest I rearrange a few islands! lol); to Rupert Harding at Pen and Sword for eternal patience in awaiting the book's delivery; to Brian Elliott for his skilful editing of the material; to Emma Howe, Lisa Hooson, and others at Pen and Sword for marketing etc, and to the many genies, students, blog readers and more who have been in touch to alert me to new developments online, and to all those who supplied images and permissions for screengrabs. And of course, on Valentine's Day, to my lovely wife Claire, and to Calum and Jamie, for their eternal support and constant tea supply! The book can be ordered from Pen and Sword at www.pen-and-sword.co.uk or from www.amazon.co.uk. This might help if your ancestor had a funny handshake down south...! An increasing amount of archive material on freemasonry in England and Wales has been catalogued by the Library and Museum and the searchable catalogue is available on the website www.freemasonry.london.museum/catalogue Working towards 2017 the Library and Museum of Freemasonry is undertaking a number of initiatives, including events and publications, to encourage more research into the role of freemasonry in English society.